There are so many things you don’t understand or appreciate about your family until you are older and can see them from a different, wiser perspective. I’ve been thinking a lot about my mother lately. Probably it’s because Mother’s Day is coming up and I miss my mother terribly. And because I am always thinking about food, I’ve been re-examining a lot of things about the way my mother ate. We were a family of omnivores but I never appreciated just how many vegetarian meals my Mom ate. While I’d like to say it was because of the animals, I can’t. We were that family of “animal lovers” who didn’t make the connection between the animals we loved and the animals we ate. My mother had a dog, Tiny, for over 17 years. Tiny was her “first-born child.” Mom loved that dog more than anything. Tiny, according to the stories, was extremely smart. She once alerted people when my grandfather was being mugged at knifepoint in the elevator of our building even though she was way down the hall inside the apartment. My grandfather (my hero) also loved animals and when he and I would go for walks, we would carry bread and peanuts to feed the birds and the squirrels. My mother and grandfather both always proclaimed that they loved animals way more than people (which I totally understand). But as Will Tuttle writes in The World Peace Diet, we inherit our food choices. We learn from our parents as early as infancy and we adopt the food culture of our family. Being very religious, my grandfather kept Kosher. Being poor after escaping to the United States from Austria, meat was a luxury to him. My grandfather taught my mother how to select and buy the “good cuts” of meat from a Kosher butcher. My mother passed that knowledge down to us. As children, we would go with Mom to the Kosher butcher and when my sister wasn’t scaring me with the chicken heads and feet, we were learning how our mother selected our food. She would never buy packaged meat. She would never buy already ground beef. She would inspect the meat and choose which cuts she wanted. Any ground meat had to be ground in front of her, not in the back of the store. Although I grew up in a Kosher home, I was not forced to keep Kosher when eating out. Whenever we went to a restaurant, I would eat whatever I wanted (usually burgers or fried chicken) but my mother would never eat meat out. Part of her reasoning was that the meat wasn’t Kosher but I remember her always saying, “You don’t know what they put in it.” She vehemently distrusted burgers or any ground meat if she couldn’t see what went into it. She was always worried we would get sick but like so many mothers do, she indulged our wishes. She didn’t forbid us from eating it but she chose not to. Now, I watch a movie like “Food, Inc.” and read about all the meat recalls and realize that my mother was way ahead of her time. She was right to not trust what went into meat. My mother may not have been educated about animal cruelty (including the cruelty of Kosher meat) or animal rights but she ate more vegetarian meals than anyone I ever knew growing up. We say everyone is a potential Vegan. I truly believe my mother had that potential in her. I wish she had been here when I started learning and began my Vegan journey so I could have shared it with her. 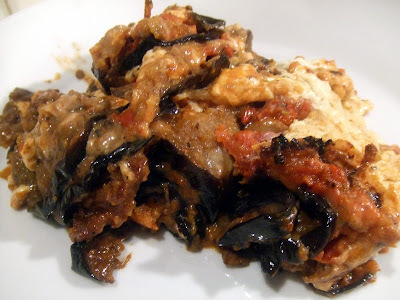 One of my mother’s favorite dishes was Eggplant Parmigiana. That was something she would make herself (my mother was the BEST cook) and something she would eat out – but only at one or two places because almost no one’s Italian food measured up to her own. I still have trouble eating Italian food anywhere because it just doesn’t taste like Mom’s. When I make sauce, I want it to taste just like hers. Most of the foods I miss were dishes she made and I often wonder how amazingly she would have cooked Vegan food. 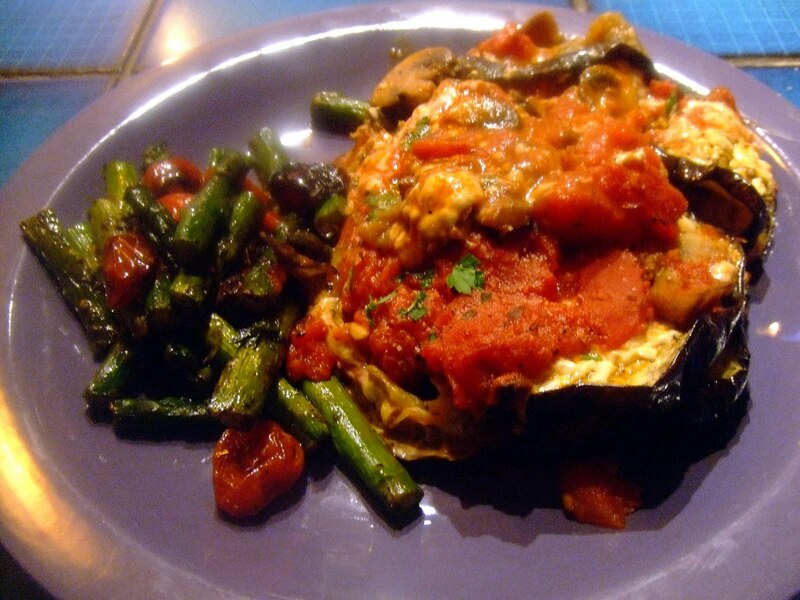 My version of Eggplant Parmigiana is a little different from my mother’s. 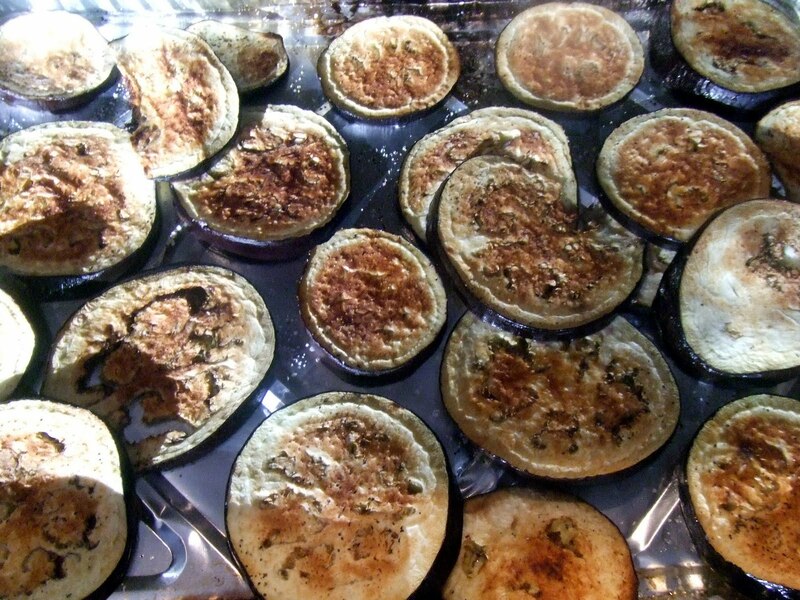 It’s baked, rather than fried, because eggplant soaks up oil like a sponge. Not frying it also means no flour or bread crumbs so this recipe is very diet-friendly. And of course, it’s Vegan. If you prefer a richer dish, try my Eggplant Rollatini with Spinach Tofu Ricotta here. This recipe is dedicated to my Mother for Mother’s Day and everyday. I love her and I miss her. If only she could see how I’ve learned to cook, I like to imagine she would be proud. Preheat the oven to 400 degrees. Cut the ends off the eggplants and discard. Slice the eggplants into ½ inch rounds or long slices (whichever shape you prefer). Note: I do not peel the eggplants; I like the texture and taste of the peel when it’s baked. I also don’t salt or drain eggplant. I have never found the taste to be bitter but when you make it, do what you like). Place onto baking sheets that are oiled with cooking spray. 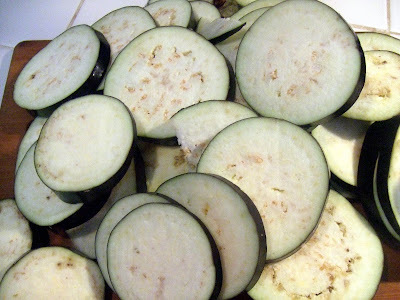 Sprinkle salt, pepper and garlic powder on both sides of the eggplant slices. Spray with additional cooking oil. Bake for about 20 minutes, flipping the slices half-way through. 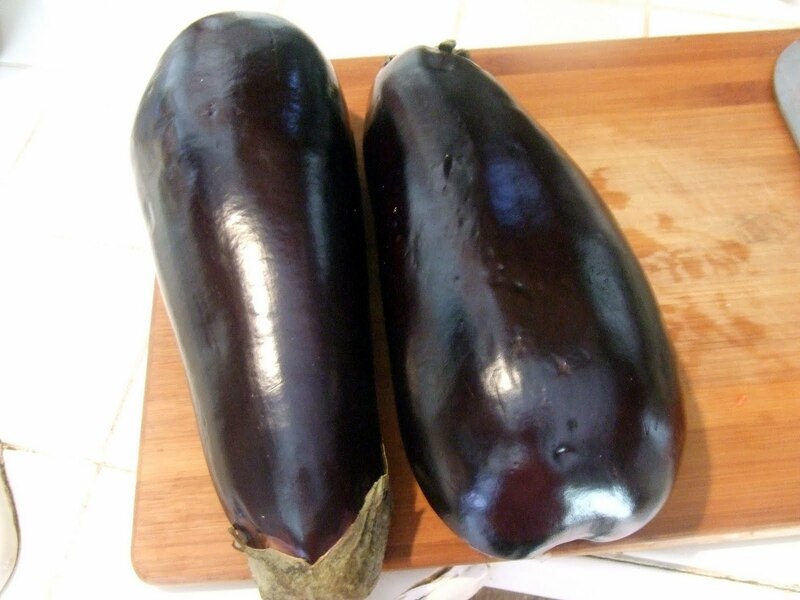 The eggplant should be browned and softened but not falling apart. While the eggplant is baking, make the mushroom marinara sauce. Heat olive oil in a medium size saucepan. Saute red pepper flakes, onion and garlic a few minutes until softened. Add mushrooms and let brown a few minutes. Add crushed and diced tomatoes and stir. Mix in spices and herbs. Cover and let cook on low heat for about 15 minutes. That’s it. Simple, huh? 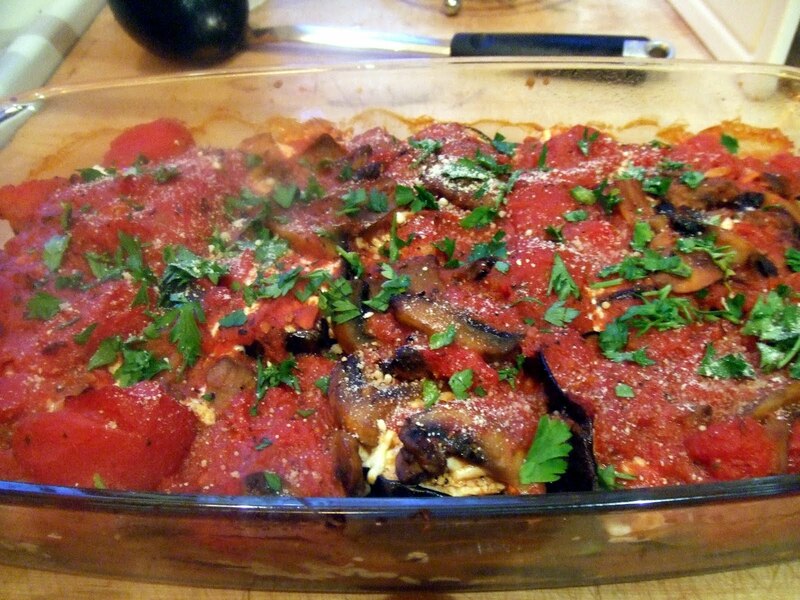 When the eggplant is done, oil a casserole dish with cooking spray. 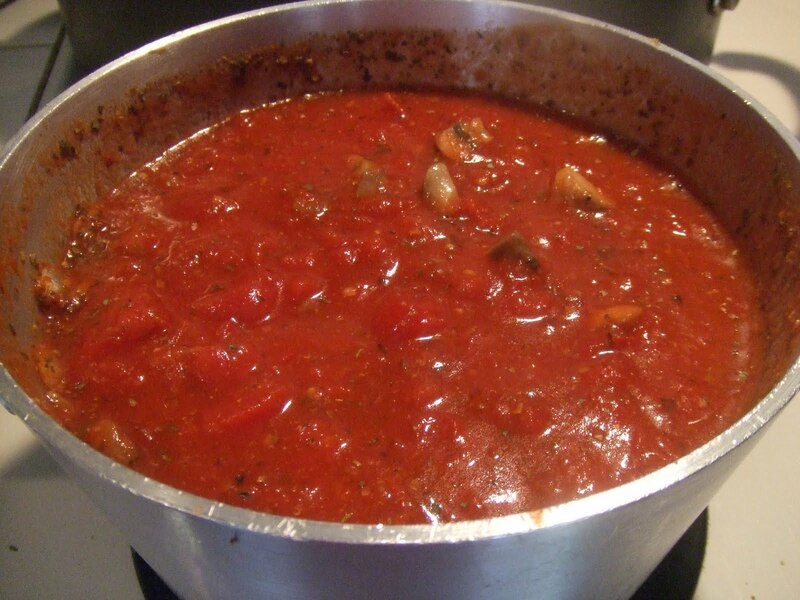 Ladle some marinara sauce to just layer the bottom of the casserole dish. 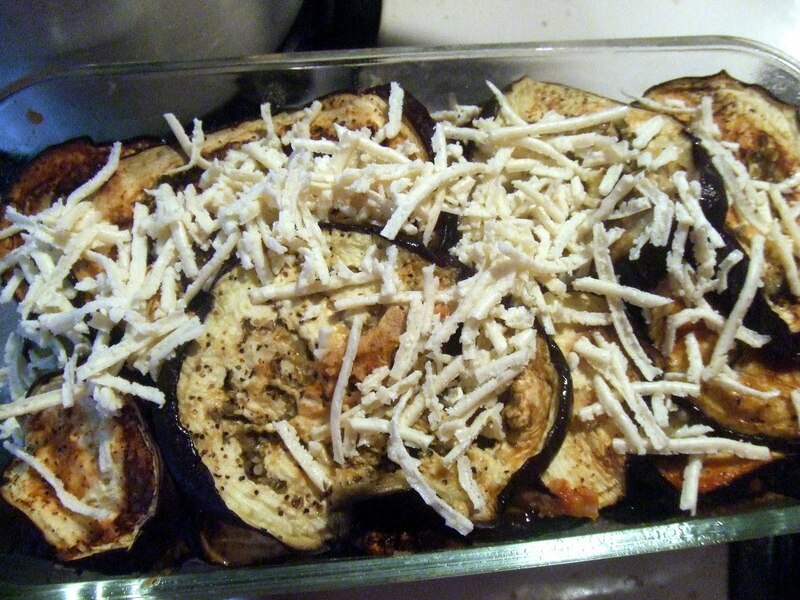 Place slices of the eggplant into the casserole dish. If you want it extra cheezy, you can sprinkle some Vegan mozzarella in between the layers of eggplant. Layer the slices of eggplant until you fill the casserole dish. Sprinkle the Vegan mozzarella onto the top layer of the eggplant. Then cover with ladles of marinara sauce. I’ve learned through trial and error that the cheeze melts better if it’s under the sauce rather than on top of it. Place the casserole dish in the oven and bake for about 15 minutes or until you see the sauce bubbling and the cheeze has melted. Remove from the oven and let it set for a bit. The longer it sits, the better it sets (and it’s even better the next day). 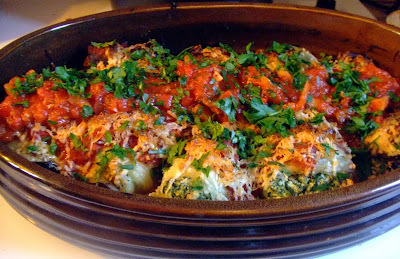 Serve with extra mushroom marinara sauce, Vegan grated parmesan and parsley to garnish. Another sweet story, Rhea. Thanks for sharing, along with another amazing looking recipe. Happy Mother’s Day!